The California Rifle & Pistol Association (CRPA), founded in 1875, is a nonprofit 501 (c)(4) membership and donor supported organization. CRPA employs full time staffers in Fullerton and Sacramento offices, works with thousands of volunteers across the state, and is controlled by an independent Board of Directors. 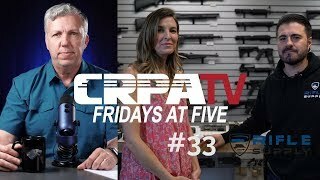 CRPA works relentlessly in California to defend your constitutional right to keep and bear arms. Your CRPA membership dues and donations help CRPA to fight for your right to choose to responsibly own and use firearms for hunting, sport, or to defend yourself and your family. Some of CRPA’s non-profit efforts are funded through CRPA’s sister organization, the CRPA Foundation (CRPAF). CRPAF is a 501 (c)(3) organization, therefore contributions to the CRPAF are generally tax deductible. To comply with California’s campaign finance laws, the CRPA Political Action Committee (CRPA PAC) funds CRPA’s efforts to elect politicians at the state and local level who respect and defend the right to keep and bear arms. CRPA is proud to be the official state association of the National Rifle Association (NRA). CRPA and NRA work together in California as a team fighting for your rights in Sacramento, in cities and counties across the state, in regulatory agencies, and in the courts. Working together, CRPA and NRA complement and enhance each other’s ongoing efforts and multiply their effectiveness, accomplishing more by working together on your behalf than either could accomplish working alone or separately in California. Beware of imitators! The CRPA and NRA national team of highly regarded civil rights attorneys, legislative advocates, and scholars has the experience, resources, skill and expertise needed to maximize the potential for victory in California’s often hostile political environments. Even with the generous rates that our team of civil rights attorneys, legislative advocates, experts and consultants grant us, these ongoing efforts are still expensive. You can support our pro-Second Amendment efforts in California by donating to the CRPA, CRPAF, or CRPA PAC. All dues and donations are spent to specifically benefit California gun owners. For a summary of some of the many actions NRA and CRPA have taken on behalf of California gun owners, click here.